The mountain of Arunachala, Thiruvannamalai, is a monumental linga affording protection to animate and inanimate world in addition to the incomprehensible galaxy of bodies in Brahmic manifestation. As a place endowed with the potentiality for erasing sinful karma and for promoting prospects of salvation, Arunachala is the only one of its kind. Further, it is the one which blesses the pradakshina-bound devotees with its rays of aurora transcending the facets of greatness narrated in this book. 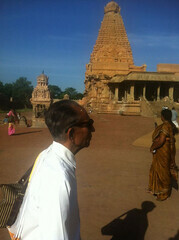 Arunachala confers blessing not merely on siddhas and mahaans but even on ordinary devotees. There are tunnel paths to all kshetras in this world from this place. All those who merit the description of Mahaans, Siddhas, Saptha Rshis and Gods take a formless state and make use of the tunnel paths to reach the said Shiva kshetras for performance of pujas. Thus, this range acts as the connecting link. 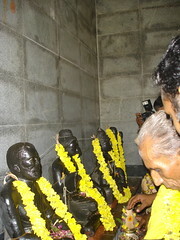 Feeding (Annadanam) taking place here washes one’s sins and fortifies fortune besides begetting Divine Grace. That precisely explains why many have made it their abode and settled there. What may well be counted as a secret is that those who undertake sincerely the pradakshina or Angapradakshina of the mountain can have darshan of the Lotus Feet of the Lord denied even to deities. This mountain which emerged as a vivid form of the Brahman for the benefit of the residents of Bhu-loka casts, within a minute or second, its spell of attraction. It can be described as an inexhaustible cup – an Akshaya Paatram. Is not Arunachala an Akshaya Paatram for human beings? Above all, the mountain is such a “cup” and an inexhaustible source of tattvas and indicator of such attainments such as dhyana, mukti and siddhi. This is the mountain which reveals itself in its true form. Arunachala symbolises Devi’s “Aikyata” or identity with Shiva. It is the insignia of the union of Shiva, Brahma, Vishnu and others. Verily, this mountain defies comparative assessments. The Mahaans go round this mountain after assuming their physical frame – a phenomenon not seen anywhere. This narrative is like the Vedas and has a unique presentation, it can be styled as the Fifth Veda. It is rendered in simple language, as a Shiva Veda. The narrative throws light on the secrets of the mountain and its relevance and significance. The author has, by virtue of the Grace he gained in his previous life, known the facts and anatomy of Arunachala and shed light on its greatness, its Mahaans, the oneness of Shiva and Devi and the unity of the trinity (Trimurthi). The narrative is a boon to living beings. The author has presented it as a divine guide to earthly beings. The author has done a great service to the spiritual lore. Throughout this work, he has thrown subtle light on the divine secrets by the enriched knowledge drawn from several Naadi texts and homas. This Shiva Veda is a commendable one. It is my desire that his narrative should be read with the same great devotion that accompanies our performance of pujas in a temple. A reading given to it will bring benefits conferred by japa and thapas. For his painstaking efforts, on behalf of all Mahaans, devathas and forms, My Delightful Blessings to him for further spiritual attainments, dhyanam, fortunate things and higher fulfilments. Arunachala in Thiruvannamalai holds more in its bosoms than most people know. Skandapurana declares there there is no beverage superior to drinking water, no gift better than Annadaanam, no kshetra greater than Arunachala and no God higher than Arunachalaeswara. The author owes his knowledge of Arunachala to the Divine Grace of Sadguru Sri Seshadri Swamigal. 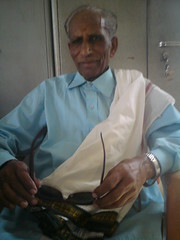 Seshagita was authored by Mahaan Seshadri in Tamil. A Kannada translation by the author appeared in December 1999. The English version is placed before the readers with reverence to the Mahaan. The Aurora of Arunachala is indeed about the greatest mountain which glows brilliantly with its aurora or “solar” rays seen better at night! The light it sheds is a lesson in Jyothish-chakra Vidya or Renuka Vidya dearest to upasakas. The author is indebted to Bhagawan Seshadri Swamigal for the blessings and for the unique introduction to this narrative. The author invokes the Grace of the Guru, Arunachalaeswara, Apeetakuchamba, Gautama Rishi and saints of Arunachala on all readers.